Don Lynch’s “basketweave beading” technique (also known as Don Beading) gives your beads a woven look. 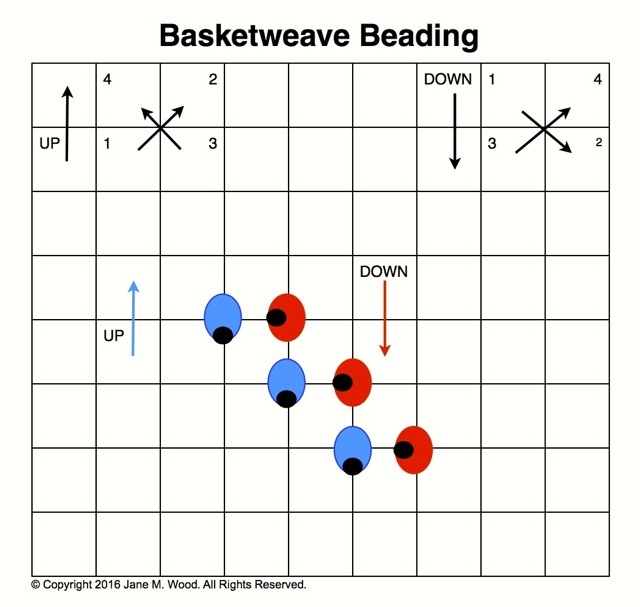 This is easier than you would think—you work up and down diagonal rows as if you were doing basketweave, but the beads are attached with cross stitches. However, the cross stitch on the “up” rows is created differently than the cross stitch on the “down” rows. This creates the woven look. You do have to use hex beads to get the full effect. Make sure that your beads are all the same size. 11/0 or 14/0 beads work best on 18 count. Also, don't use this in a large area. The more beads you add, the more difficult it is for them to stay in position. If you work this in an area more than two inches square, you may start to loose the woven look because the beads wiggle out of position. In the diagram the Up rows’ cross stitches are created by following the numbering system next to the up arrow. The Down rows are created by following the numbering system next to the down arrow. In the example above, you can see the hole in the middle of the red "bead" is oriented differently than the holes in the blue "beads." If this is too confusing you can just tent stitch the beads into position but this is a lovely technique I urge you to master. If you'd like to see how Don explains this technique, check out the Associated Talents' website. There are many free stitch guides there that use this. This is just one. 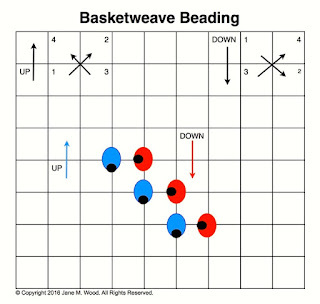 Louise's Needlework just wrote up a nice tutorial with great diagrams and photos about basketweave beading. 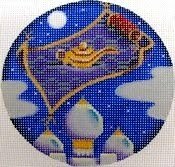 Needlepoint.com has an introduction to beading on their website with recommended tools and a short video that shows how to attach beads with a cross stitch. Do your beads look wrong? Here's how to fix beading issues. Robin King has a wonderful tutorial on beading on her blog. She covers everything from the type of thread to use to the size needle to how to keep your bead from wiggling by the use of a pin stitch. What's a pin stitch? Not to worry—Robin Explains All with diagrams. Then Robin goes on to explain brick stitch beading. Robin's final article on beading talks about messy beading, lasso beading, rows of beads and fringe, plus piggy backing beads to create dots. Louise's Needlework has a nice article about beads that explains the differences in sizes. Louise's also has a great follow-up article on beading thread types and beading needle sizes. Louise's also has an explanation of backstitch beading, which is perfect for curved lines and lettering. Louise's just added a tutorial on beaded fringe. 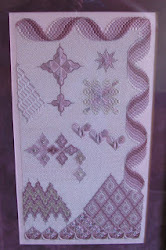 Needle Works in Austin has diagrammed several types of beading styles. 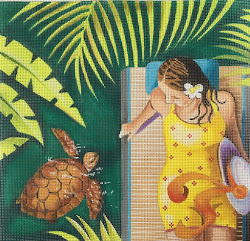 You can see diagrams for brick stitch beading, for stuffing beads inside Flair, for tent stitch beading, for attaching single beads with a cross stitch or a loop, and for basketweave beading. Brick stitch beading is nicely explained by this BeStitch/Needlepoint Flix video. Here are more beading tutorials and hints. I never realized the beading needle sizes were coordinated to the size of the beads until I read this. (By the way, the bead sizing chart that reads "15 (degree)" means 15/0 or 15°. Louise's Needle discusses bead finishes with tips for shading with beads. Mary Corbet has collected a list of links to thread-bead or bead brands conversion charts.